Yup, the Canon 5D Mark III is serious business. That sweet bit of kit is a pro-grade camera and a total lust item. But there's another reason to love it: It just made its elder sibling, the 5D Mark II, the best deal in cameras. 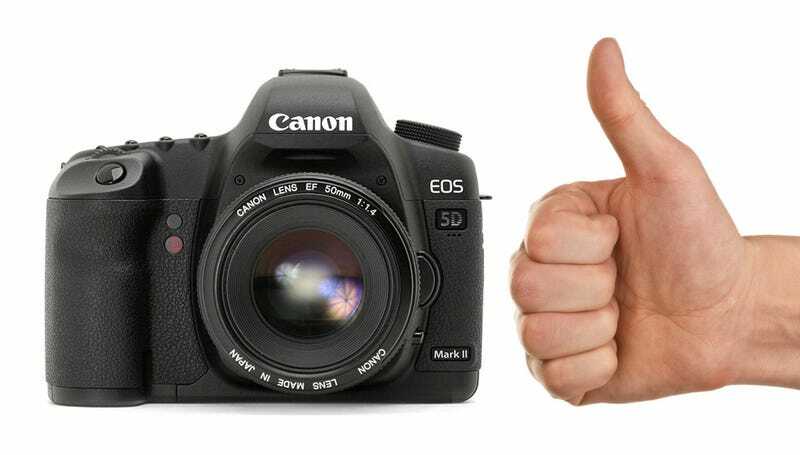 Thing is, though the 5D Mark III is an evolution of the Mark II, it's not replacing it. Canon will continue to make the Mark II. With a sticker price that's already a grand less than the Mark III and declining steadily, the Mark II is probably the perfect camera for some folks. So if you've been eyeing one for a while now, but have been holding off to make sure it wasn't replaced with a better model, you might want to still seriously consider picking one up. Here's why. For $2,500 you're still getting one hell of a DSLR with full HD video recording capabilities and brilliant low-light performance. Yes, it was released way back in 2008 and the 5D Mark III one-ups it in many areas. But DSLRs tend to age very gracefully, and Canon obviously feels the 5D Mark II still has plenty of life left to keep it in the lineup. One of the most sought after features in swappable lens cameras these days are its video capabilities. And the 5D Mark II wowed the videography world by being one of the first DLSRs to include full 1080P recording capabilities. In fact, the Mark II has become widely used in Hollywood over the past few years in films like Iron Man 2 and Captain America. It was even used to film the entire season finale of House last year, and when coupled with the right lenses and post-processing, the camera is still a video powerhouse. Recently, Nikon's upcoming D800 made splashes with its massive 36 megapixel sensor. But as we've pointed out before, more megapixels don't automatically equate to a better camera. And Canon certainly agrees here. The 5D Mark III has just a 1MP advantage over the 5D Mark II, and even its soon-to-be-released 1DX only weighs in at 18.1 megapixels. And like the 5D Mark III and the 1DX, the Mark II still has a full frame sensor ready to grab as much light as it can for crisp images even in low-light conditions. Unless you're willing to fork out the cash for a large-format camera, this is as big as DSLR sensors get, and during our hands-on review of the Mark II we found we could push its ISO all the way to 6400 with negligible noise in dark conditions. Being able to actually push a camera's ISO limits with usable results was mind-blowing, and as DSLRs go, the 5D Mark II's low-light performance is still remarkable. So while the 5D Mark III certainly has everyone oohing and awing at the moment over its improvements to the Mark II, you're still going to have to fork out an extra $1,000 for what are, in many cases, only slight advantages. For $2,500 the 5D Mark II is still one of the best bargains in photography, and certainly still worth your cash. As long as you're not interested in buying the latest model for bleeding-edge bragging rights, the proven 5D Mark II is still a brilliant choice. Particularly if you invest that extra $1,000 you saved in your photography kit, with a wicked-fast prime lens, a capable zoom, and a host of other lenses which will improve the camera's capabilities where it really counts.